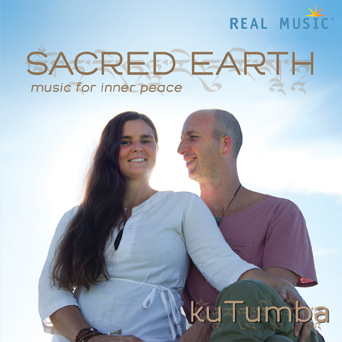 “Om Tare” is a wholly immersive track from Australia’s Sacred Earth. From the onset the act is able to create a musical landscape that elicits comparisons to a desert clime. As the composition continues to play, the rich flute and string dynamic that is created ensures that listeners are on the edges of their seats. The track continues to evolve, bringing in a perfectly intertwined duet of vocals. “Waves of the Sea” nearly makes it to the eleven-minute mark and has a certain pop flair that is reminiscent of Cyndi Lauper or a Broadway coupling. There are minor twists and turns that Sacred Earth will bring to listeners that keep things interesting from stem to stern. The ability of Prem and Jethro to create something that can be enjoyed on so many levels increases the replay value of kuTumba considerably. “Gayatri Mantra” keeps things light and airy, contributing to the overall tapestry of kuTumba by having an insistent tempo and a wide array of instrumentation. While this track makes it nearly to the ten-minute mark, the cheerful demeanor makes it fly by as if it was a small fraction of that. This titular cut on kuTumba does well to unite the wide array of sounds and influences that bubble to the surface during the album. “Song for the Elementals” is an eleven-minute composition that concludes kuTumba and represents the most alluring effort on the album. There is an epic feeling to the song that only intensifies as it continues to play; all elements combine here to make something that will resound deep in listeners’ souls.